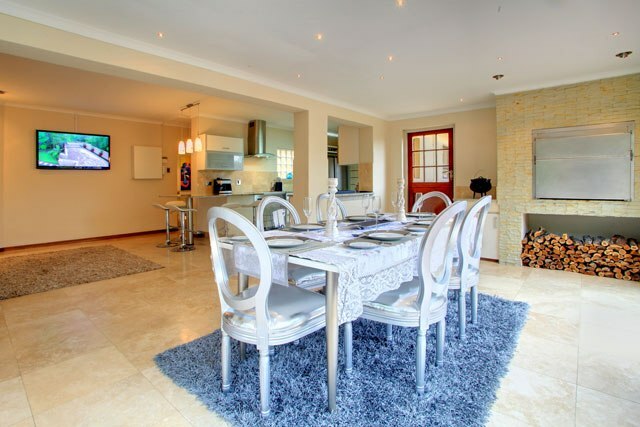 Jakaranda Villa is a chic and luxurious 5 bedroom home centrally located in the sought after suburb of Camphersdrift, George. 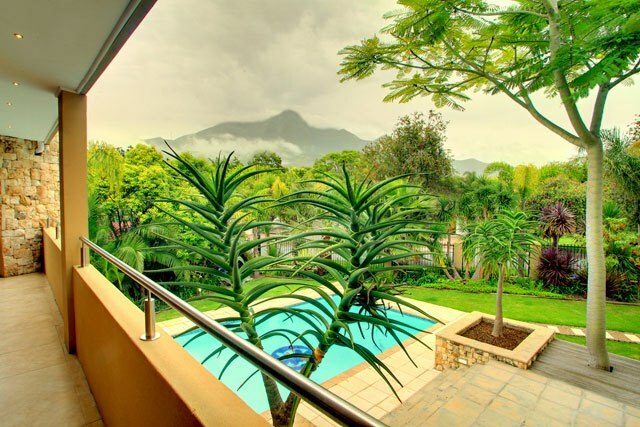 This designer, triple storey villa is surrounded by a lush garden, boasts spectacular views of the majestic Outeniqua Mountain views and is within walking distance to the city center, top restaurants, theatre, botanical gardens, museum and more. Absolute tranquility infused with the sound of birds will keep you company as you relax in your natural surroundings. Jakaranda is a perfect home-away-from-home for both the business and leisure traveler. 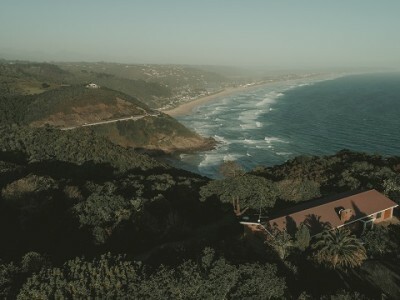 It’s an extremely popular base for golfers from which to enjoy some world renowned courses, including Fancourt, Pinnacle Point, Oubaai and Pezula. There are 5 bedrooms sleeping 9 people very comfortably. 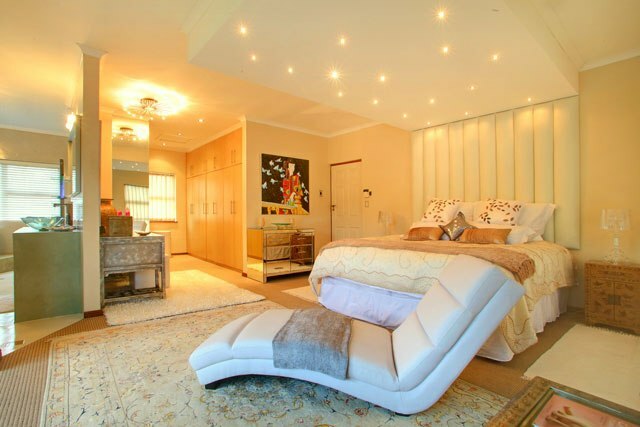 TOP LEVEL Open-plan main bedroom with a full designer en-suite bathroom and separate dressing room. 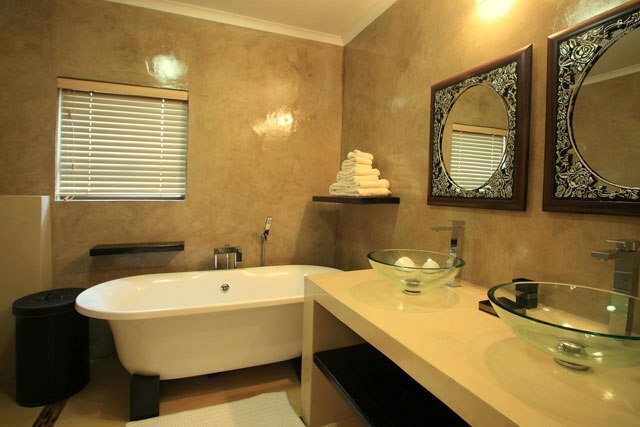 Spectacular bathroom with oval corner bath and large double shower. Room opens onto a private balcony with seating area – beautiful mountain views. A small side bedroom with sleeper couch, ideal for a young child. No view. GROUND LEVEL 1 Bedroom, en-suite with shower over bath. 2 Other bedrooms, sharing a separate stunning bathroom with bath and shower, also a separate toilet. 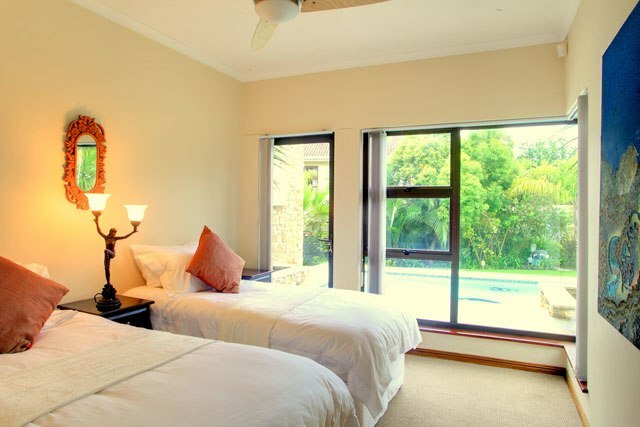 All rooms have direct access onto the garden and pool deck. Garden and pool views. Living Area – On the mid level, a spacious TV lounge with library and massage chair. Opens onto an undercover balcony, with dining table, BBQ and mountain/garden views. 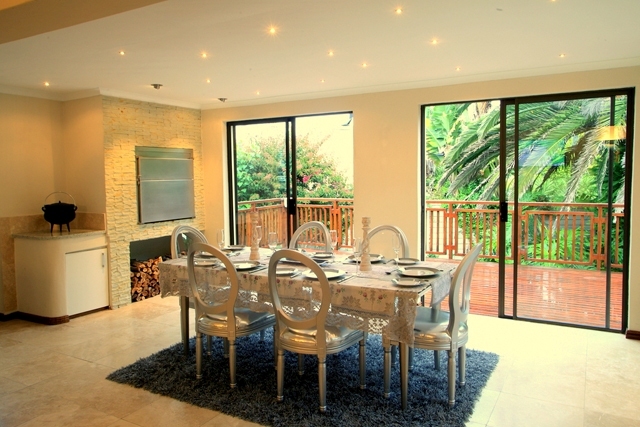 Dining Area – On the ground level, a stylish dining room leading off the kitchen. With indoor built-in BBQ/braai. Opens onto a wooden deck with additional seating area. 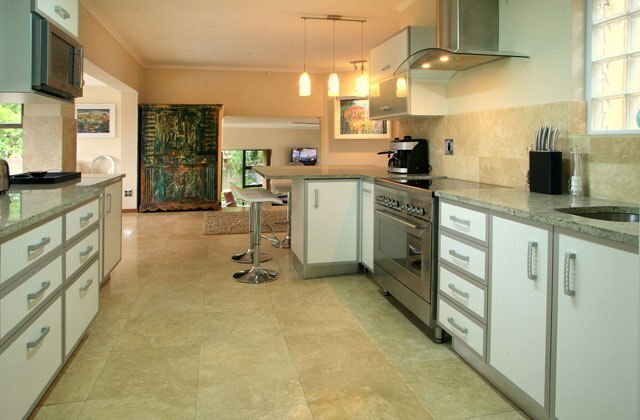 Kitchen – A stunning, fully equipped kitchen with separate scullery. 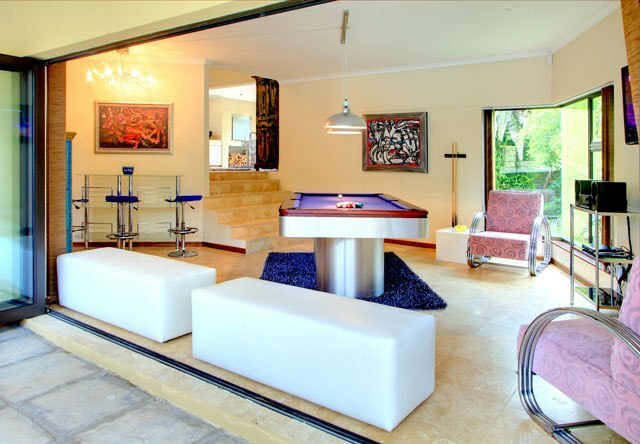 Games Room – A separate games room with small Snooker Table and seating area. 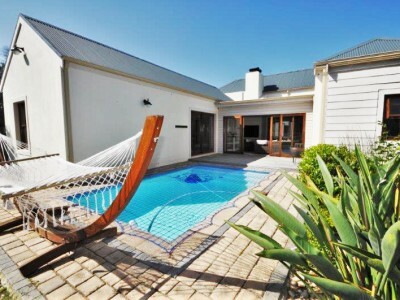 Opens onto the outdoor entertainment area and swimming pool. Outdoors – Undercover seating area, lush garden, sparkling swimming pool. 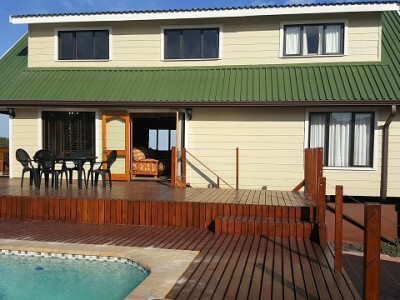 BBQ, Swimming Pool, Games, DVD collection, Wifi & DSTV. Ample parking. A luxury Land Cruiser vehicle can be arranged for use during your stay, upon request and subject to availability. NOTE: The pool area is not toddler friendly. Ample secure off-street parking for 4 – 5 cars. Included. Two permanent on-site staff are appointed to take care of your every need and make your experience more pleasurable. Meal preparation and laundry service upon request. 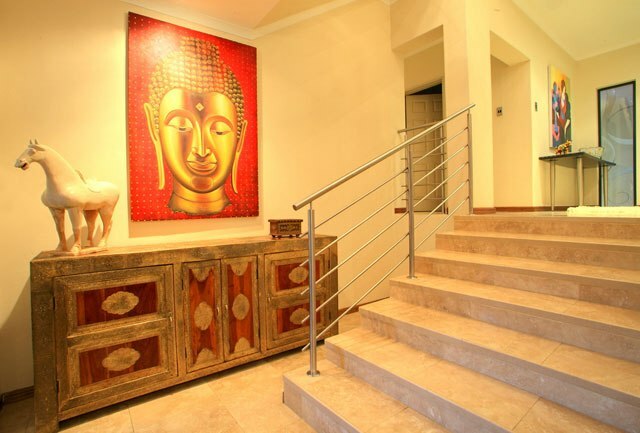 In a residential suburb, within walking distance to George City Centre. 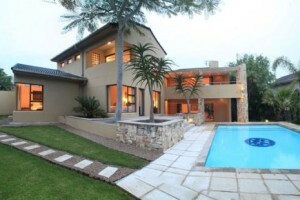 Jakaranda Villa, George, 5 Bedroom Luxury Villa.